Tenderfoot is finally ready for her publishing debut! The final road was long and hard…ahem…there were rewrites and recharting in spades (btw, do you know how hard it is to get “clever engineering” from inside your head, down onto a piece of paper so other can understand WTF you’re trying to convey?) Then, I had to make sure my model was available in the location I wanted, and that the weather cooperated that particular day. But, voila! she is done! I love knitting socks, but whenever I knit a pair for me, they’d go ignored, unloved, neglected, carefully folded in my sock drawer. Unfortunately, when I wear hand-knit socks all day, the bottoms of my feet would feel like they were on fire from walking on the nubs of the purl stitches the entire time. 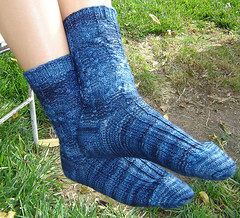 So this design features the sole of the foot knit in such a way that the smoother, knit side is against the skin, thus making it more bearable for this or any other tenderfoot to wear their beautiful hand-knit socks, and it’s engineered in such a way that this fete is achieved while never purling a single sole stitch! This sock is knitted toe-up with a short-row heel. The top of the foot is knitted in a 2 x 2 rib which then transforms into a very pleasing collection of 4 x 4 intertwining cables up the leg, ending in a simple 2×2 cuff. The pattern uses 1 skein of Dizzy Blonde Studios Superwash Sock (go figure), size 2 needles, and either a working knowledge of cable knitting, or the desire to acquire such knowledge. The ribbing on top of the foot makes it so that they can fit a wider size-range. 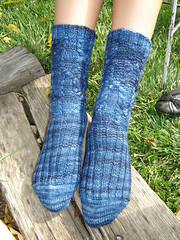 Knit in gauge, they fit woman’s size 7.5 – 9 feet. The pattern is now available on Ravelry. If you’re not a member of Ravelry (which poses the question: huh???!) You can purchase the pattern at Dizzy Blonde Studios. And if for some reason you forget where either of those are, I have links to both, not only on my sidebar, but on my pattern page as well. Enjoy! I love it! I am not a tenderfoot (I wear hand knit socks almost every day), but I love the idea of the alternative sole. very pretty sock. Read your last post. Totally get the non-writing issue. I edit other people’s crap all day long. It’s hard to want to BLOG on top of that! Can you believe my tadpoles are going to be five at the end of this month? Purl side out? I keep hearing that solution but a pretty pattern displaying it!